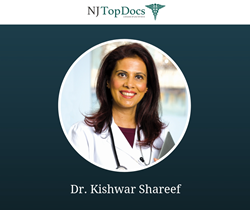 Apple recently added NJ Top Doc, Kishwar Shareef, MD to their list of healthcare providers who support sharing health records on the iPhone. Apple’s latest update to the beloved iPhone includes changes to their Health app. The Health app now allows a growing list of healthcare professionals to share health records directly to their patient’s iPhone. NJ Top Doc, Dr. Kishwar Shareef has recently been added to the list of doctors participating in this beta phase of the Health app. The full list of healthcare institutions participating in this beta program can be found here. Dr. Shareef’s participation in this beta feature enables her patients to view important data such as immunizations, lab results, medications, and vitals directly inside the Health app of their iPhone. According to a new ONC data brief, 52% of patients were offered access to their medical records in 2017, where as in 2014 only 42% of patients were offered access. Although access through patient portal technology now allows patients to have an expanded view of their health in a greater capacity, only a few features are being utilized. Perhaps this is because of the standard online browser functionality. According to the data, 84% of patients said they own a smartphone or a tablet. This is great news for Apple and all participating healthcare providers, as now patient’s medical records can be easily accessed in the palm of their hands as opposed to having to attempt to remember a login password on the internet. Kishwar Shareef, MD PC is a comprehensive primary care practice specializing in internal and metabolic medicine. Dr. Shareef is a highly skilled physician who brings over twenty years of professional experience to her patients. She is board certified in internal medicine and passionately focuses on the health and well-being of all her patients. Dr. Shareef’s steps toward making health records more easily accessible through the use of Apple’s Health app is a wonderful advantage her patients can now benefit from.